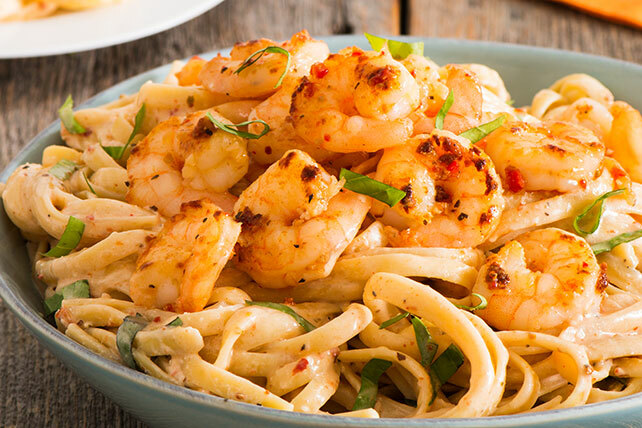 Sun-dried tomatoes and fresh basil give this creamy, cheesy, shrimp-and-fettuccine Alfredo skillet great colour and additional flavour. Meanwhile, heat 2 Tbsp. dressing in large nonstick skillet on medium heat. Add shrimp and garlic; cook on medium heat 3 to 5 min. or until shrimp turn pink, stirring frequently. Remove from skillet; cover to keep warm. Blend remaining dressing, broth, sun-dried tomatoes, cream cheese and Parmesan in blender until smooth. Add to skillet. Bring to boil on medium-high heat, stirring constantly. Simmer on medium-low heat 5 min., stirring occasionally. Drain pasta. Add to cheese sauce in skillet along with the basil; stir to evenly coat. Serve shrimp over pasta mixture. Garnish with additional chopped fresh basil and/or parsley before serving.